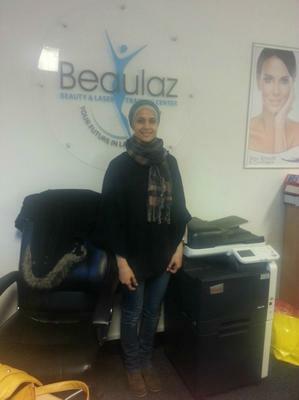 Whilst being on the laser training course with beaulaz I have gained a lot of confidence with using the laser machine and have also learnt many skills with regarding different laser techniques. Being on the course it has given me all of the knowledge needed in order for me to open my own salon and perform laser on my own clients. I would recommend this course for anyone who would like to be a qualified laser therapist as you are given the necessary amount of knowledge regarding all things to do with hair laser removal andalso skin rejuvenation. The teaching method used is brilliant as it is step by step and it is all quite easy to take in, with a lot of practical involved therefore it gives your more confidence for once you are qualified and have to use the machine independently. 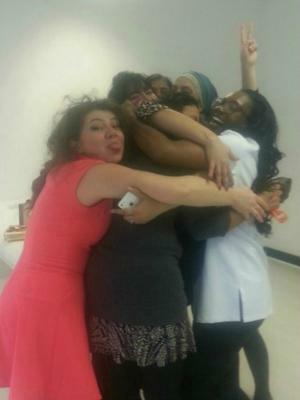 When I started this course I felt very nervous and lacked in confidence, I felt scared. However now I feel that I have gained confidence and good communication skills, this was mainly due to my teacher Talha, who has been very supportive and pushed me to learn and develop my practical and theory skills. I have learnt a lot of knowledge, such as health and safety in work place, client care communication, and practical skills. Overall I feel that Beaulaz college is warm, welcoming atmosphere, the receptionist Halima and Samhad have also been very helpful and supportive. I am very happy that I have done this course with Beaulaz. And I also recommend my friend's and Family to do courses here. I am very happy with the NVQ level 4 hair removal course. Talha was a brilliant tutor. She offered great support to myself, very helpful. Always stayed behind lessons for extra support, also she goes out her way to arrange practical classes. She really has great knowledge in what she teaches. 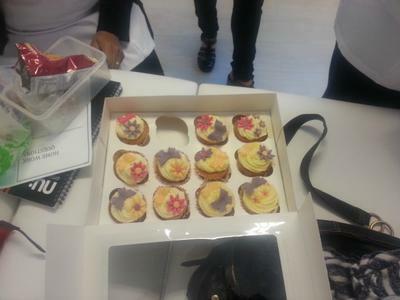 My experience on this course was amazing especially having talha as a tutor she is so knowledgeable. I was struggling with my course. I booked a one to one private lesson with talha she went above and beyond she even stayed behind many hours using her time until i left the course feeling confident. Talah the company and the course are great I have even advised friend to go threw this company the teaching and the company are ten out of ten . ANY ONE READING THIS I STRONGLY advise you to book with this company and I hope you get the pleasure of talha . You were ray of hope in my life brightened up my knowledge and experience and given me reason to be at top of laser knowledge . 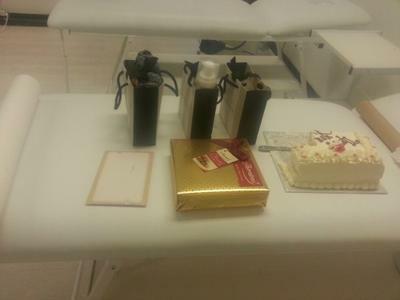 It was so scary at the beginning, when I was going to do my beauty course. I was nervous, but when I spoke to Talha, she made me feel comfortable and settle into the course. I have had a very nice time during this course. I had a fun time with my class mates because they are all very nice my teacher as well. When you do your practical work you don’t feel scared, as you feel that you are in your comfort zone. I was so comfortable with the treatment; Talha’s teaching is so good, she teaches very nicely and explained everything to you. She gave us all the log books on time, and she explained to us all the things that we had to do. Everything that I have learnt I am very pleased with. I think I have made the right decision to choose Beaulaz and I am so proud to be a student of Beaulaz. 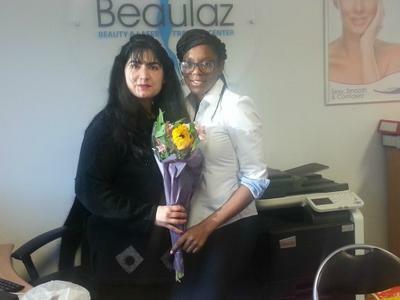 If someone asks me about any beauty college I would recommend Beaulaz. 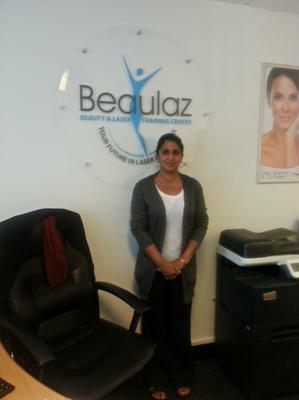 Thanks Beaulaz and thanks Talha for giving me the opportunity to do my NVQ level 2 in beauty therapy general. If I was going to do any other course in my future I will come to Beaulaz. I have found this course very informative and interesting. As I was new to this topic, I feel I have gained a lot of useful knowledge and skills. We have been taught in a variety of ways, such as class discussions and practical’s. Talha has been a great teacher. She is very accommodating meeting every individual’s needs. Talha has been very supportive and understanding throughout this course, providing extra support and teaching when required. The classes have been very enjoyable and active, with masses of knowledge. Although this course has been very intense, Talha has provided extra support, making it possible for us to complete. I feel the level of teaching has been very good and has appropriate content. I have a very busy lifestyle with three children, work and another course I am studying simultaneously, therefore I have needed some extra support and time form Talha, which has been useful. I will recommend this course to my friend (in fact I already have done so!) as I have found it absolutely brilliant. I feel very confident in using the laser and IPL machine for treatments, which proves the level of knowledge and skills I have learnt from this invaluable course. I've been working in beauty therapy for 2 years prior to this course. So I had some knowledge of the treatments. As a new student to this course and college. When I arrived I was impressed with the standards of the college. Talha made me feel very welcome. Talha is very experienced and has knowledge in the beauty field, which was very impressive. Talha has taught us a lot in the last 8 weeks and made some good friendship in the class. My course tutor has been supportive from the start, and has been very patient with me, as I have had a few family problems, but Talha gave me a chance to finish on time with everyone else. Talha would use the class free time to help me with issues. I've learned a lot like health and safety, client care and communication, Anatomy and Physiology, which I enjoyed the most. Learning about the function on the body and skin, which was very interesting. The hands out that were given also helped me a lot with my assignments. I got to be salon manager for the day and learned, and learned how to delegate duties to others. My management skills have expanded. I liked the fact that we could bring our own food to the college, as the college has supplies such as microwave, which made us feel more comfortable. Support from reception provided as well. Talha was hands on when I needed to make corrections, and she explained everything, and simplified the task to make it easier and more enjoyable. My client who came for assessment also felt very comfortable, and enjoyed the experience of having the treatment at the college. Well I have recently done level 4 course with beaulaz and it was the best experience of my life , two way communication was provided , course tutor was so helpful , honest and open-minded and her knowledge was out of world . She has practically demonstrated everything in details with question answer session and theoretical explanation in details. Equal opportunities provided to us, She was non-discriminatory and fair to all. Her lesson plan well supported all students and individual needs. I am more than happy and satisfied fully with the quality of teaching provided by talha. I will certainly recommend my friends and family to bealaz as I had teacher like talha . Health and safety regulations was addressed fully by her and enough practice was provided. Induction material was given day one with all relevant forms. Assessment books was explained thoroughly . I was very clear from day one what am I supposed to do as student. Please keep doing the good work and producing more satisfied students. I will certainly come for further courses with college .